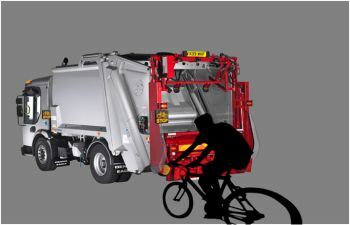 Vehicle safety technology company, Innovative Safety Systems Ltd (ISS), has developed a system to warn cyclists when HGV’s, refuse trucks and large vehicles are turning left. Statistics show that cyclist injuries caused by collisions with HGV’s are much more likely to be serious or fatal. In its 2006 ‘Cyclists and Lorries’ factsheet The Royal Society for the Prevention of Road Accidents (ROSPA) reported that the percentage of cyclist fatalities caused by crashes with HGV’s was 22% across the UK. In the same year, nine of the 19 cyclists who died on London’s roads were involved in a collision with a goods vehicle. The Cyclist Warning Display System comprises of two parts; the externally mounted LED Display Module (26cmx22cmx7cm) and the internally mounted Control Box. The Display Module communicates with cyclists and is mounted to the near side of the vehicle at the rear. It displays an image of a bicycle and the word ‘STOP’. When the driver indicates to turn, these images are triggered to illuminate amber, warning cyclists that a manoeuvre is imminent. There are optional audio warnings available; a standard alarm that attracts the cyclist’s attention to the display; and a fully programmable version that allows messages to be played, such as ‘Warning, vehicle turning left’. The system works in conjunction with ISS reversing radars, providing additional detection and driver warning. With this system the CWDS is not triggered by the indicator mechanism but instead by the presence of any object that is detected within the detection zone. The first CWDS will be in use by mid-October and Gavin is confident that it will prove to be a popular item of safety technology. Based in Leicestershire, ISS is a one-stop shop vehicle safety and efficiency provider encompassing product development, supply, maintenance and service. ISS products include reverse camera systems, vehicle CCTV, hard disk recording (DVR), reversing radar, fuel saving module, vehicle tracking, LED lighting and warning beacons.